Various enriched recycled oceanic components in the source of Cenozoic intra-plate alkaline basalts from eastern China were identified by previous studies. Due to the existence of a stagnant subducted Pacific slab in the mantle transition zone beneath eastern China, it is logical to connect the stagnant slab to the recycled oceanic materials. However, the recycled oceanic materials could also result from ancient subduction events (e.g., Paleo-Tethyan, Paleo-Asian or Izanagi plate subduction) because enriched geochemical signatures of a recycled slab can be preserved in the mantle for longer than 1 Gyr. Investigating the temporal variations of the recycled oceanic materials in the mantle source is a useful way to trace the origin of the basalts. 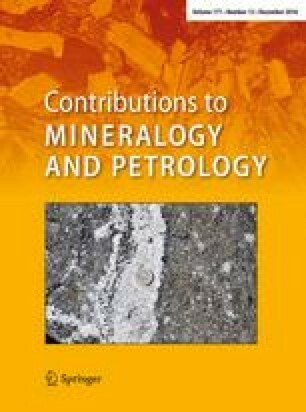 In this article, we have conducted a detailed geochemical study, including major and trace elements and Sr–Nd–Pb isotopes, on two alkaline basalt groups from Zhejiang, SE China, which erupted 26–17 Ma and after 11 Ma, respectively. In particular, we recovered the H2O content of the initial magmas based on the H2O content of the clinopyroxene (cpx) phenocrysts and the partition coefficients of H2O between cpx and basaltic melts. The H2O contents of the Zhejiang basalts range from 1.3 to 2.6 (wt.%), which fall within the range of back-arc basin or island arc basalts. The older basalts are more alkaline and have lower Si and Al contents; higher trace element concentrations; higher La/Yb, Ce/Pb and Nb/La ratios; lower H2O/Ce and Ba/Th ratios; and stronger negative K, Pb, Hf and Ti anomalies than the younger ones. The co-relationships between Ba/La, H2O/Ce, Nb/La, Ce/Pb and Ba/Th in the two groups of the Zhejiang basalts indicate that a recycled dehydrated oceanic alkaline basalt component is needed in the source of the older rocks, along with a depleted mantle component. Meanwhile, an additional recycled dehydrated sediment component was required in the source of the younger rocks. The temporal change in the recycled oceanic materials in the mantle sources of Zhejiang Cenozoic basalts demonstrates that the recycled components can only originate in the stagnant Pacific slab that is the only plate subducted since 100 Ma in this area. The online version of this article (doi: 10.1007/s00410-016-1310-4) contains supplementary material, which is available to authorized users. This work was supported by the National Natural Science Foundation of China (No. 41225005) and the Fundamental Research Funds for the Central Universities. We appreciate constructive comments and suggestions from two reviewers and the editor Hans Keppler.